A commentary on the Book of Daniel and slavery abolitionists – is there a connection? 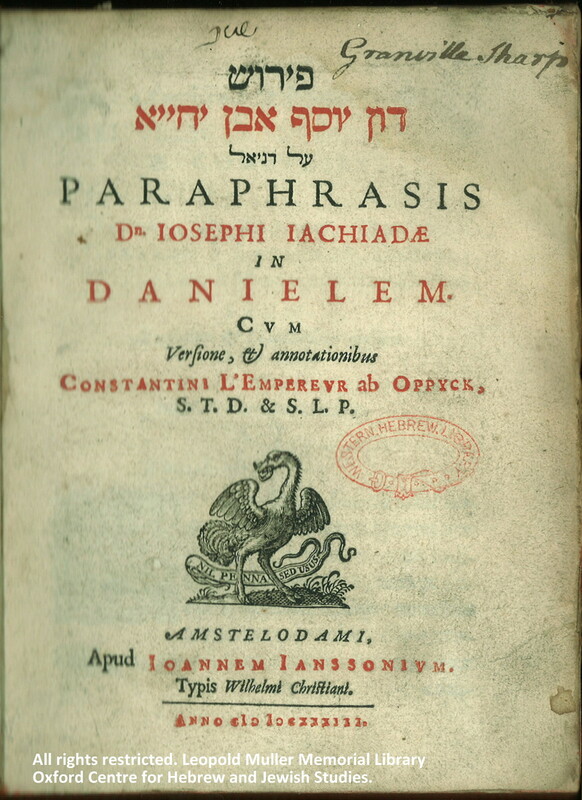 The title page of our copy of Constantijn L’Empereur’s commentary on the Book of Daniel (Paraphrasis Don Iosephi Iachiadae in Danielem, Amsterdam, 1733, shelfmark: W B797) bears a signature of one Granville Sharp. Could he be the Grandville Sharp who was a pioneer in the abolition of slavery in Britain? The latter Sharp (1735-1813) was born in Durham into a clerical family and was interested in biblical scholarship, antiquariansim and linguistics – he taught himself Greek and Hebrew. He was member of the Society for the Propagation of the Gospel and the first chairman of the British and Foreign Bible Society. Owning a commentary on Daniel written by the seventeenth-century Dutch Hebraist Constantijn L’Empereur seems like a probable match. Also in the Dictionary of National Biography, there is only one Granville Sharp recorded at all. However, to be sure that “our” Sharp is the abolitionist Sharp we would have to compare the signature in our to book to a verified signature. If any of our FB followers has such a signature at hand…. now is the time to contribute to the further exploration of our collection! This entry was posted in Highlights, Western Hebrew Library on 16 January 2014 by zeidlerm.